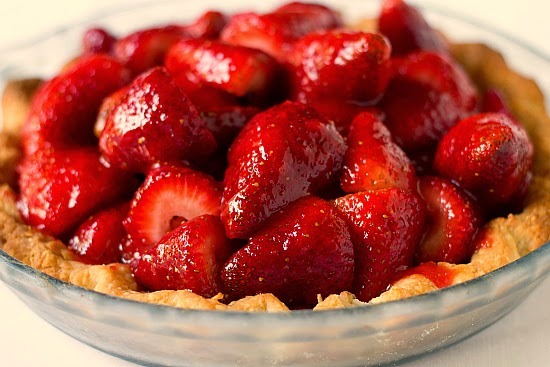 Strawberry, strawberry, and more strawberries are here this season and you can make a pie.if you like a cool cake too...Got recipes for you. pick over the berries and measure out 2 pounds of the most attractive ones. Add the berries to the bowl with the glaze and fold gently with a rubber spatula until the berries are evenly coated. 3 pounds fresh strawberries taking the little green hats of and gently rinsed and dried. Select 1 1/2 cup misshapen, overripe, or not so cute berries, In a food processor, process the berries to a smooth state, scraping down the bowl as needed. Whisk the sugar, cornstarch, Sure-Jell, and salt in a medium saucepan. Stir in the berry puree, making sure to scrape the corners of the pan. Cook over medium-high heat, stirring constantly with a spatula, and bring to a full boil. Scoop the berries into the pie shell, piling into a mound. If any cut sides face up on top, turn them face down. If necessary, rearrange the berries so that holes are filled and the mound looks attractive. Refrigerate pie until chilled, about 2 hours. Serve within 5 hours of chilling and add topping.